Following the sport's traditional lengthy summer break, Formula One action resumes at Spa with the picturesque backdrop provided by the Ardennes. The weekend has not been uneventful off the track with the ownership change at the Force India team and with several drivers seeking for new adventures for the 2019 season. 1. Valtteri Bottas got away with a reprimand after his on-track misunderstanding with Stoffel Vandoorne. At 12:49 during the final free practice session, Valtteri Bottas, coming out from the pit lane and executing a start practice, dived at reduced speed on to the racing line without noticing the fast-moving McLaren of Stoffel Vandoorne. To avoid any contact at a speed over 300kph, the Belgian dived onto the grass and span, making light contact with the barriers. The stewards said that Bottas’ move was „potentially dangerous”, but he conceded that the incident was his fault as he did not see the McLaren approaching, they only decided for a reprimand which was the first one for Valtteri Bottas in he current season. 2. The race stewards of the Belgian GP exposed a fine to Williams driver Sergey Sirotkin after the Russian exceeded the maximum speed in the pit lane during the third practice session. At 12:59, the former GP2 runner was 1.1kph faster than the maximum of 80kph which resulted in a fine of 200 EUR. 3. Force India have lost all its point which it has collected throughout the first half of the season. The team was rescued from administration by a consortium of investors which means the team, now called as Racing Point Force India, is a completely new entity and entrant. But like a phoenix rising from the flames, it’s been a strong start for the new team, locking out the second row for today’s race. “It’s a massive opportunity for the team, especially now the team has zero points. Maybe [today] we can get plenty of them!” Sergio Perez hopes for the team’s first points. 4. Force India will lose its place on Formula 1’s Strategy Group which it has had since 2015. The Strategy Group is made up of representatives of the FIA and FOM, plus the Ferrari, Red Bull, McLaren, Mercedes and Williams outfits – as well as the highest finishing team in the previous year's constructors' championship. 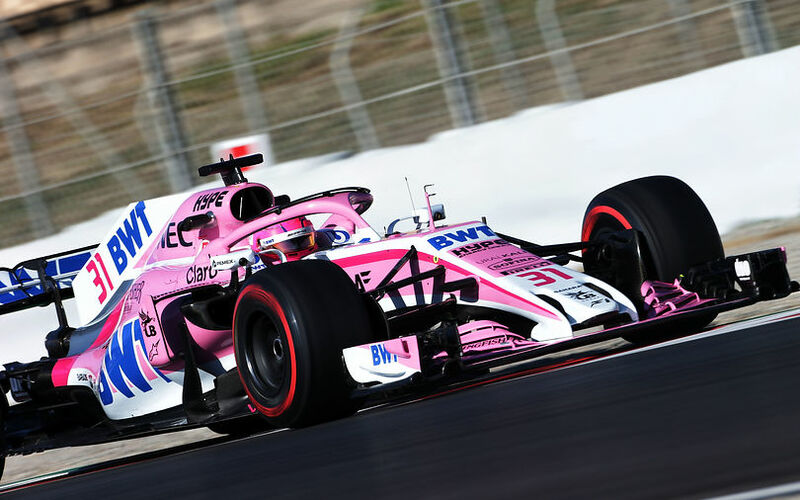 However, as Force India was rescued from administration as a new entity, it will now lose not only its points gained so far this season, but also its place in the influential group. 5. After driving Fernando Alonso’s MCL33 during the first free practice session of the Belgian Grand Prix, Lando Norris will get another outing at Monza next weekend. McLaren sporting director Gil de Ferran confirmed that the team wanted to give the current F2 front-runner another run after the post-Hungarian GP test and Spa outing to give him chance to develop with a lower downforce level. This also indicates that Lando Norris is in the running for the second McLaren seat for 2019. 6. Sebastian Vettel’s effort during Belgian Grand Prix qualifying means a Formula 1 car has reclaimed the fastest unofficial lap of Spa-Francorchamps from Porsche’s 919 Hybrid LMP1 ‘Evo’ machine. Neel Jani set an unofficial lap record of 1:41.770 around the 7.004m Spa race circuit in a revised Porsche 919 Hybrid Evo in April. Vettel topped the second qualifying segment with a 1:41.501 to shave off 0.269 tenths from Jani’s time. The official lap record is also held by the quadruple world champion who clocked a 1:46.557 in last year’s Belgian Grand Prix. 8. Mercedes team chief Toto Wolff indicated that his team will explore all opportunities as it evaluates a closer tie-up with Force India. Ferrari has been working closely with the American Haas squad since it debuted in Formula One and the Italians commenced a closer collaboration with Sauber Alfa Romeo team at the beginning of the year, a move triggered by the former Fiat Chrysler CEO and Ferrari President Sergio Marchionne. "The result [of Belgian Grand Prix qualifying] confirms my respect for them in terms of racers, and within the permissible regulations we will explore all avenues,” said Wolff.